01.08.2018 16:40:36 - Energy-efficient construction and renovation become increasingly important: Around the world, countries set up diverse support programs for a better insulation of buildings. 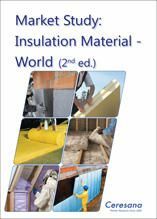 (live-PR.com) - For the second time already, Ceresana analyzed the global market for insulation material. The new study offers a complete overview on materials used in the construction industry for thermal and sound insulation in particular: Mineral wool (glass and stone wool), polystyrene insulation material (EPS and XPS), and polyurethane (PUR). analysts expect a total demand of more than 578 million cubic meters in 2025. In general, thermal insulation is supposed to minimize heat loss and thus, energy consumption in cold climate regions. However, in warmer climates, insulation is also used as a heat barrier. Rising energy prices and state regulations to prevent climate-changing greenhouse gases or to conserve energy will lead to a higher demand for insulation material in the upcoming years. In terms of renovations and refurbishments but also new buildings, there have been regional differences in the past years: In countries hit hard by the economic crisis of 2008/09, the construction sector in particular suffered dramatic losses. Construction industries in countries like Germany, on the other hand, experienced a much more positive development. In the industrial nations in Europe, North America, and Asia, existing building structures are mainly energy efficiently renovated; the new construction of buildings accounts for a rather slow dynamics. In emerging countries, considerably higher numbers of new buildings are constructed. The economic situation, factors such as the unemployment rate or disposable income as well as the demographic development impact the respective insulation material demand. However, a decisive factor for the country-specific demand is how quickly support programs can be implemented – and if an improvement of energy efficiency is also important for the population. Currently, mineral wool is the worldwide most frequently used type of insulation material. Glass and stone wool reached a combined demand of 52%, with glass wool being used more often. Polystyrene-based insulation material also has a high market share, while consumption of insulation materials based on PUR is notably lower. However, consumption of individual types of insulation materials may vary considerably in individual countries. Besides climatic factors and customer preferences, cost of acquisition, image, and technical properties are influential factors. Chapter 1 provides a complete description and analysis of the global insulation material market – including forecasts up to 2025. Key figures such as production and demand, as well as revenues are given for each world region.